Fast data communication has become the basic need of todays world and Internet has become the heart of the communication ecosystem. Devices like mobile phones (whose purpose is voice communication) are having Internet connectivity and PCs, laptops etc (which are mostly used for web surfing) are now also being used for voice communication. So we see that technologies are converging or intermixing to provide fast and easy communication. Same was the case with cable TV infrastructure which was initially setup for receiving television signals from cable operator to subscribers home. The need for transmitting and receiving IP data was felt on the existing cable TV infrastructure. Some cable modems were designed by vendors to cater this need but lack of interoperability was a major issue. 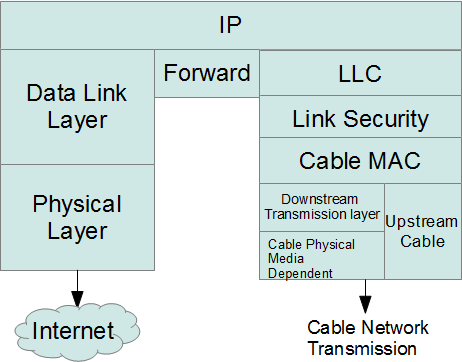 To standardize the cable TV infrastructure that supports IP data flow (from internet to cable modem and vice versa) the DOCSIS technology came into existence. Docsis stands for Data Over Cable System Interface Specification. It defines the interface specifications for cable modems that are involved in high speed data (MPEG and IP) transfer over existing cable infrastructure. If we talk about DOCSIS network then there are two major components in this system : (1) CM-> It stands for cable modem and it is located at subscriber end. Various devices like PC, laptop, phone etc can be connected to it. (2) CMTS -> It stands for cable modem termination system and it is located at the cable operators end (also known as head-end) and connected to Internet. NOTE : DOCSIS has two variants. There is a European version on DOCSIS known as EURODOCSIS. While American version is known as simply DOCSIS. The certifying agency of DOCSIS in America is cable labs while in Europe the certifying agency is Excentis. The reason for two separate variants of of DOCIS is the difference between in frequency allocation bandwidth between Europe and America. A cable modem termination system (CMTS) at the cable operator end (also known as head-end). Cable modem (CM) which is located at the subscribers end. CM and CMTS communication over HFC cables. Bi-directional data flow happens between CM and CMTS. The path from CM to CMTS is known as upstream channel while path from CMTS to CM is known as Downstream channel. Data in downstream is sent on independent 6Mhz channels while on upstream a single channel is used by all CMs. In upstream TDMA technology is used for multiple access as several CMs are using same upstream channel to send data. Since most of the data flow is assumed to be in downstream direction hence the downstream bandwidth is high as compared to upstream. But, with the growing trends such as on-line gaming etc, the upstream bandwidth is fast catching up with the downstream bandwidth. Note that multiple cable modems can be connected to a single CMTS. 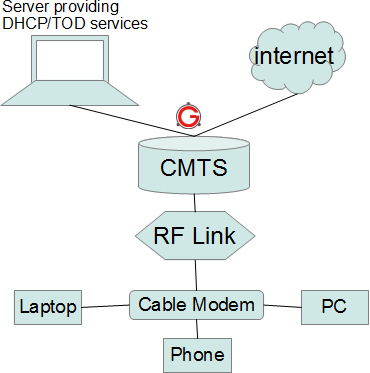 Its the CMTS that provides services like DHCP, Time of the day (TOD) etc to the CM (that is the reason it is connected to various servers as shown in figure). The above image shows only the CMTS portion of the stack. CM and CMTS both can act as end hosts and forwarding agents. While sharing some controlling information the packets are destined to CM and CMTS only so in that case they act as end-hosts while in case a device connected to CM is interacting with some other host on Internet then in that case the CM and CMTS are only acting as forwarding agents. Since CM-CMTS can act both as end-host and as forwarding agents so different protocol stacks exist in CM/CMTS for each role (as shown in the figure). CM-CMTS interaction holds the key to smooth bidirectional IP data flow on the existing cable infrastructure. To achieve this in DOCSIS network, the IP packet goes through a completely different protocol stack (as shown in the figure). LLC (Logical Link Control) layer is used for address resolution (for identifying source and destination addresses). Security layer is used for providing data encryption so that data remains safe on network. Mac layer provides the protocol for CM-CMTS interaction. Using Mac messages the CMTS and CM share control information between each other. PHY layer deals with transmission and reception of data on the cable network. In case of US flow, PHY layer is composed of US PMD layer. In case of DS flow, PHY layer is composed of TC layer and PMD layer. In case of US flow, access methods like FDMA/TDMA/S-CDMA are used. The use of these methods is configured by the CMTS via MAC messaging. header followed by 184 bytes of payload. The header identifies the payload as belonging to the data-over-cable MAC. PMD receives and demodulates the data and sends up the protocol stack. DOCSIS version 1.0, 1.1, 2.0 and 3.0 are out in market. With version 1.1 the quality of service (QOS) was added in April 1999. To cater to high upstream bandwidth demands, in 2001 DOCSIS 2.0 was released. DOCSIS 3.0 was released in 2006 and this time features like high bandwidth support in both downstream and upstream and support of IPv6 etc were added. I’d just like to compliment you on the quality of the articles you publish which are mostly extremely concise. I tend to read about 60-70% of your posts as you have a knack of targeting subjects I’m interested in but am either too busy or too lazy to research myself :-). Keep up the great work! thanks. As usual I learnt something new today. I’d like to congrats you for the article! By the way, I work with this technology here in Brazil and I think It’s developing fast enough! Today we are working with DOCSIS 3.0, but, with some differences, like upstream multiple access that we use ATDMA and SCDMA (some cases) and with modulations 16QAM and 64QAM to obtain more bandwith per upstream. Maybe, in the next month, I’ll be able to offer Video on Demand through HFC networks! Might clarify things to point out that there are multiple (numerous) CM’s per CMTS circuit – unlike DSL which is basically PtP (premise to multi-channel DSLAM). Which means with Cable, if the local loop (i.e. CM-to-CMTS) is over sold, there is no way the end user will see the advertised speed.